I’ve been using a system for long range ballistic compensation based around the Weaver V16 scope for a number of years. The Weaver V16 has nicely marked, medium-height, hand-adjustable turrets. The turrets do have caps, unlike a lot of the tactical or varmint type scopes, which have very large and very high turrets with no caps. Large exposed turrets are a liability in the game fields. Once you have established your zero, the Weaver’s turrets can also be reset to a zero reference mark. One full rotation of the turrets is 12 inches at 100 yards, with a click every quarter inch. The adjustments are nice and reliable. You want three inches up? Click up 12 clicks to the “3” index mark. Couldn’t be simpler. So after chronographing a favorite load, I would run the numbers on ballistic software to make a click-chart with the “come-ups” or click settings for every ten yards from 200 to 500 yards. This chart gets taped to the stock so that in the field, you: 1) see target; 2) range target with laser rangefinder; 3) consult click chart for ranged distance; 4) click the scope up to the correct setting; 5) fire! This is a great system. As long as you’ve put all the right numbers into the software, and as long as your rifle is capable of holding decent groups out to the farther ranges, you’ll be able to hit anything that you can range. I’ve recently discovered one large drawback, though. To use this system, you’ve got to be able to read the chart! You older guys know what I’m talking about: presbyopia. It’s when the eyes can no longer focus on anything closer than arms length. In the last couple of years, my short-range vision has gone kaput! Between steps 2) and 3) above, I now would have to insert a step 2a): fish around for reading glasses and put them on. Then after step four, I would have to take more time to take the glasses off before looking through the scope. By the time I would finally be ready to squeeze the trigger, that deer would have long ago gotten bored and moved off. Fortunately, there is an alternative system for long range ballistic compensation that is even faster to use, and still works with aging eyes: the ballistic reticle. Scopes with various types of ballistic reticles have really come on strong in the last couple of years. Burris has come out with their Ballistic Plex and Ballistic Mil-Dot scopes. Leupold also has two versions that they call the “Boone and Crockett” reticle for big game hunting, and the “Varmint Hunter’s” reticle for use on fast-stepping varmint rifles. Bushnell and Pentax are other companies now offering ballistic reticles in their scope lines. I’m sure there are others. One of the earliest companies offering a ballistic reticle was Swarovski. They brought out the TDS Tri-Factor reticle, then later started offering it in Kahles scopes. Kahles (pronounced CAW-less) is a subsidiary of Swarovski. Both Swarovski and Kahles are based in Austria – Swarovski in Absam and Kahles in Vienna. 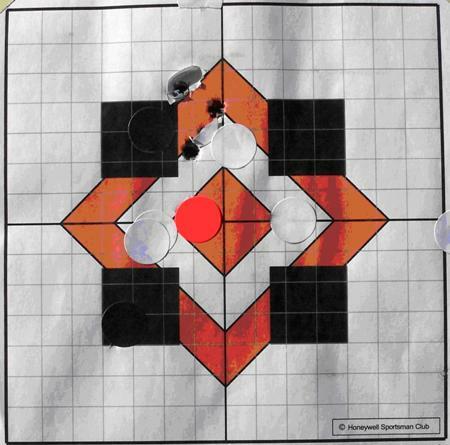 A ballistic reticle is characterized by a central crosshair with additional aiming points or bars on the vertical crosshair below the central intersection. Because the trajectory of a bullet is a curve, these additional aiming points are not usually spaced equally as they proceed down the vertical bar. They could be though. Mil-dots and the Bushnell TRX reticle are examples that are equally spaced. 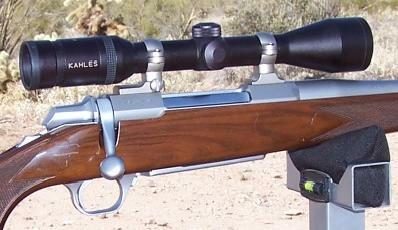 A couple years back, I stumbled on a beautiful Sako Hunter in 7mm Rem Mag at a price I could not resist. I figured it deserved a higher-end European scope, so I dished-out the most money I’ve ever spent on a scope and bought a Kahles American Hunter 3-9x42 with the TDS ballistic reticle. The option of the TDS reticle added something like $60 to the price over the same scope with a standard reticle. This premium goes straight to Mr. T.D. Smith, the inventor of the TDS reticle system. I’ve recently made the decision to divest the Sako from my collection, but I’m keeping the scope. My favorite big game rifle for many years has been the Browning A-Bolt .30-06 I purchased in July of 1995. It has been wearing a click chart on its stock and a Weaver V16 for a long time, but now my eyesight has dictated a change. The Kahles is now married to the A-Bolt. The scope manufacturers offer various shortcut methods for the non-technical buyer to understand and make use of his new ballistic reticle scope. Swarovski and Kahles for example, ask the shooter to determine his rifle’s “TDS Factor". 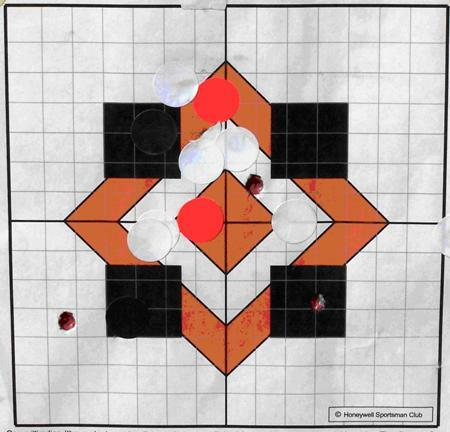 This is done by first sighting in the rifle, using the center crosshair, for a perfect zero at 200 yards. Next the shooter should take his target out to 300 yards to find out how much drop he is getting at this farther distance with his 200 yard zero. This drop, from 200 to 300 yards, expressed in inches, is his TDS Factor. Alternatively, if the shooter is using a particular factory load listed in the scope’s instruction sheet, he may determine his TDS Factor by simply reading it off the chart. Depending on the ballistic characteristics of his particular situation, the various “Range Marker Bars” (RMBs) are the hold points for the distances shown on the corresponding sticker. For shooting to distances between those shown for the RMBs, the shooter estimates his hold between the bars. The numbers aligned vertically along the left side on each sticker, from 0 to 11, are the drop in minutes-of-angle (MOA) or inches-per-hundred-yards (IPHY). The shooter may elect to either put the sticker on his rifle or scope, or he may want to commit the information on the sticker to memory -- or both. The important point to make here is that there are a lot fewer numbers to memorize with the ballistic reticle system than there are with the click-chart system, so memorization is a very viable option. I said that this is a shortcut method. From that, you may surmise that there is a long method. There certainly is. The longer method is more precise. It is the method that I use and would recommend to any rifleman committed to getting the utmost in ballistic precision out of his rifle equipped with a ballistic reticle scope. To begin a precision ballistic reticle analysis, you will first need to know exactly, what are the MOA or IPHY values of the additional hold points on your reticle. This varies from manufacturer to manufacturer. With Leupold, it even varies depending on whether you have a “Boone and Crockett” reticle, or the “Varmint Hunter’s” reticle. The distances or width of the separation between the horizontal hairline and the first, second, third and fourth range lines below the center point are 2.0, 4.8, 7.5 and 10.5 inches of subtention, respectively. You may already see where this is starting to lead. The next step is to use your favorite ballistic software to create a ballistic table for your rifle, shooting your favorite load. You will be overlaying the data generated by the ballistic software onto this chart. But at this point, you need to make a decision. Exactly how will you sight in your rifle? For the typical “high intensity” bolt action deer hunting type rifle (most bottlenecked cartridges), I think you have basically two good choices: Either run your ballistic software to give you a dead zero at 200 yards, or manipulate your zero so that your trajectory hits the drop shown for the first bar at 300 yards. Referring to the table above, you can see that Bar 1 represents 6 inches of drop at 300 yards for the TDS reticle. In the real world the difference is whether you will be sighting-in your rifle and scope at 200 yards or at 300 yards. If you only have access to a 200-yard range, you should calculate your ballistics for a 200-yard dead zero. For this kind of work, sighting-in at 100 yards is too short to know with any confidence what is happening out at 300 and 400 yards. Sighting-in at 400 yards is problematic due to the wind becoming a much more significant factor in where your bullets land. That’s why I recommend either a 200 yard or a 300 yard distance for basic zeroing, with 300 yards preferred. At 300 yards, you zero your gun using RMB-1, instead of the central crosswire. My favorite load in the Browning for the last several years has been the Nosler 165 grain Ballistic Tip over 57.5 grains of H4350. This load achieves 2800 fps. The ballistic software I use most of the time is RCBS.Load. I pick the 165 gr. BT from the bullet menu. I adjust the velocity for 2800 fps. I check the environmental factors to make sure that they are reasonable, and adjust the scope-centerline-over-bore-centerline figure. Finally, I play with the sight-in variables until I get the closest match to minus 6.0 inches at 300 yards. So what are we looking for in this chart? A couple of things. First, what is the max rise above the line of sight, and at what distance does it occur? Is it reasonable? In this example, it is 2.39 inches and it occurs at 130 yards. I like to keep my max mid-range trajectory under 2.5 inches, so that I never have to concern myself with “hold-under,” so this is good. This is the crux of the precision ballistic reticle analysis. The MOA (or IPHY) values of the RMBs were originally calculated for some bullet of a particular ballistic coefficient, fired at some specific velocity. Unless your load has the same exact specifications, your trajectory will not fall nicely onto the RMBs at perfect 100 yard intervals. The numbers on my custom sticker tell me to hold dead-on using the center of the crosshairs from 0 to 220 yards. RMB-1 will be dead-on at 300 yards, RMB-2 at 400 yards, RMB-3 at 480, and RMB-4 at 560. On the right side I have added a series of numbers to show at a glance how many yards each gap between the RMBs represents. This is handy for quickly estimating the correct hold when the game is at some distance between the dead-on values of the RMBs. The center of the gap between the crosshair and RMB-1 is 260 yards (half of 80 plus 220). For game at 350 yards, the hold is exactly centered between RMB-1 and RMB-2. The correct hold for other in-between distances are interpolated accordingly by eye. All this theory looks great on paper, but how does it work in the real world? With the Kahles now mounted on the Browning, and with my ballistics all calculated out, it was time to get outside and throw some hot lead over long distances! I packed up my truck for a day of precision rifle play out at my favorite desert practice spot. My target of-the-day was the HSC Mil-Dot Confidence Target. This is a multiple diamond target with a box around the perimeter measuring exactly two mils by two mils at 100 yards. As a reminder, one mil at 100 yards measures 3.6 inches, so in inches, the perimeter box measures 7.2” x 7.2”. The importance of these measurements is not about the mils. Rather it is about the oft-cited recommendation that accurate enough for deer hunting involves being able to hit a nine-inch diameter paper plate. Our 7.2” square box roughly translates to that nine inch round paper plate. I figured that if I could keep the shots within the box, I’ve got a dead deer. Since I had not boresighted the scope after mounting it, the first order of business was to get shots on paper at 50 yards or so. With that done, I progressively moved out to 100 yards, then 220, then 300. At 300 yards, I established as perfect a zero as I could, using RMB-1 for my aiming reference. There was some moderate wind on this day, but mostly it was blowing toward me, not across my trajectory. The top hole in the 100-yard target looks like it may have keyholed in, but that’s not the case. The bullet just happened to hit a hole in the target that was previously patched. This halfway pulled the patch into the double (triple?) hole. The three-shot group for the 220-yard target is disappointingly large. Certainly that’s a dead deer, but I sure would have liked a smaller group. These were the last shots fired for the day – shots 34, 35, and 36, without any cleaning. Of course, it also could have been the human factor. The 300-yard group is decent enough. I measure it at 4¼ inches, or about 1.4 MOA. Dead deer. The 400-yard group measure 5½ inches, again, about 1.4 MOA. The wind pushed the group 2½ inches right. One shot dropped low outside of the box. The radial distance from the center of the target to that hit, is 4.495 inches, which is just barely within the radius of the mythical nine-inch paper plate. Dead deer? Probably. But it looks like I’ve reached my practical long range limit due to accuracy, regardless of ballistic compensation. A point to keep in mind is that these shots were taken off a benchrest. You won’t have a benchrest with you out in the field. 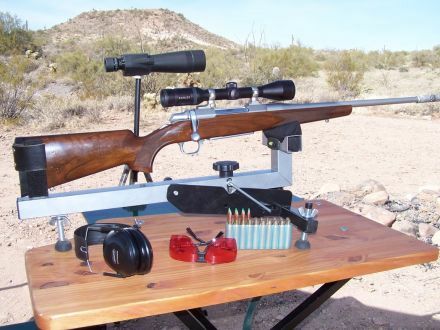 Though by using the prone position and rested on a backpack or bipod, one could get awfully close to benchrest steady. Some conclusions: First, the precision ballistic reticle analysis that I have presented here really can help you make some long shots. For example, at 400 yards the trajectory has dropped almost 20 inches below the central crosshair. But by using the appropriate RMB, you can still land your shots on target. Just always keep in mind, that in the real world, there’s no such thing as ballistic perfection. Second, the inherent accuracy of your rifle may be the limiting factor in how far you can ethically shoot, even using the best ballistic compensation techniques. Further work for me will involve trying to wrest a little more accuracy out of my rifle and ammo. Since switching over to my current load in this rifle, I have not gone back into another BOSS tuning session to see whether I really have the optimum adjustment for this load. Concerning handloading techniques, I have never sorted my cases for either weight, or by the number of times fired. Fresh cases sorted by weight are two simple steps I could take to try to find a little more accuracy in my ammo. After doing what I can to tighten up my rifle’s accuracy, next steps would involve more practice from field positions to establish my ethical maximum range under actual hunting conditions. 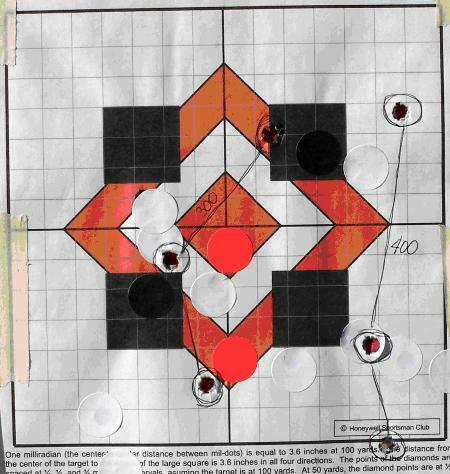 Just because the computer has told me that RMB-4 will land bullets on target at 560 yards, does not mean that I have any business shooting that far until I have proven to myself that making such a shot again and again and again within that nine-inch paper plate is reality. The current street price of the Kahles AH3-9x42 TDS is in the $700’s (whew!). I got it for a good chunk less than that some 3½ years ago. Swarovski “American” scopes with the TDS reticle go from the low $800’s to over $1000. But don’t despair! Currently you can get a Burris 3-9x40 Fullfield II scope with a ballistic reticle for around $200. This year, Leupold is bringing out a couple of new ballistic reticle scopes in the reasonably–priced VX-I and VX-II series. One new reticle in these scopes is called the Long Range (LR) Duplex, similar to the Boone & Crockett reticle in their higher-end scope lines. For varminters, they are bringing out the LRV reticle only in the VX-II line. The ballistic reticle system is inherently faster on target than the turret-click-chart method. I have too much invested in Weaver V16s to throw them all away at this point, so I’ll continue using them on the bench, where I might have time to pull out my reading glasses to make the adjustments; or on rifles primarily used by my young men. But from here on out, for extended-range big game hunting, it’s the ballistic reticle for me.